Business & Skill Awards 2016. 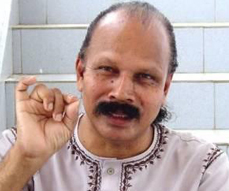 Sippy Pallippuram is a highly acclaimed children's story writer in Malayalam who has won several awards including Kendra Sahitya Akademi Award and Kerala Sahitya Akademi Award. His novel about the memories of Kunjunni Mash Oridathoru Kunjunni won the national award for children's literature by Kendra Sahitya Akademi.His book Unnikalkku Noottiyettu Gurudeva Kathakal received the Kerala Sahitya Akademi Award for Children's Literature in 2013. A teacher by profession, he has over 80 (as of 2008) poetries and stories to his credit in the children's category of Malayalam literature. Sippy has been into children's literature for more than four decades. Copyright © 2015 World Safety Forum.